굿딜-휴대폰은 새 스마트폰을 구매할때 원하는 스마트폰을 등록하시면 판매점에서 판매제안하는 방식의 매매 어플입니다. 동시에 현재 사용하는 내폰을 중고폰으로 간단한 터치로 판매할 수 있도록 서비스를 제공합니다. 현재 한국에서 판매하고 있는 거의 모든 스마트폰의 스팩을 제공하고 랭킹을 제공하여 휴대폰 선택에 도움을드립니다. 고객에게 고급 구매 정보를 제공하여 저럼하게 스마트폰을 구매할 수 있는 정보를 제공합니다. 휴대폰 큐레이터 기능을 제공하여 편리하게 원하는 상품을 찾을 수 있습니다. 알뜰폰 구매를 스마트폰에서 간단하게 번호이동 할 수 있습니다. ■ 알고사 - 웹사이트: http://www.rgo4.com - 이메일: [email protected] ★ 아직도휴대폰에 대해 아무것도 모르는 호갱님인가요? ★ 아직도 물건 구매할 때 제 값 다 주고 구매하시나요? 알고사는 바로이런분들을 위한 어플리케이션입니다. 매일매일 공유되는 핫딜 정보를 얻어가세요! - 알고사닷컴 게시판 소개 - 휴대폰알고사: 휴대폰 업체들의 판매글이 올라오는 게시판. 통신 알고사: 통신 업체들의 판매글이 올라오는 게시판. 렌탈 알고사:렌탈 업체들의 렌탈/판매글이 올라오는 게시판. 카드 알고사: 카드 설계사들의 카드발급 관련글이 올라오는 게시판. 국내알고사: 국내 할인 정보 공유. 해외 알고사: 해외 할인 정보 공유. HOT게시물: 매일 가장 HOT했던 게시물들이올라오는 게시판. 휴대폰정보: 휴대폰 구매와 관련된 기초 상식을 빠삭하게 배울 수 있는 게시판. 꿀팁정보: 일상생활에서의꿀팁을 공유하는 게시판. 자유게시판: 자유로운 이야기를 나눌 수 있는 게시판. 후기게시판: 제품 이용 후기를 작성하는게시판. 알고사 지식인: 유저들 끼리 질문/답변을 나눌 수 있는 게시판. 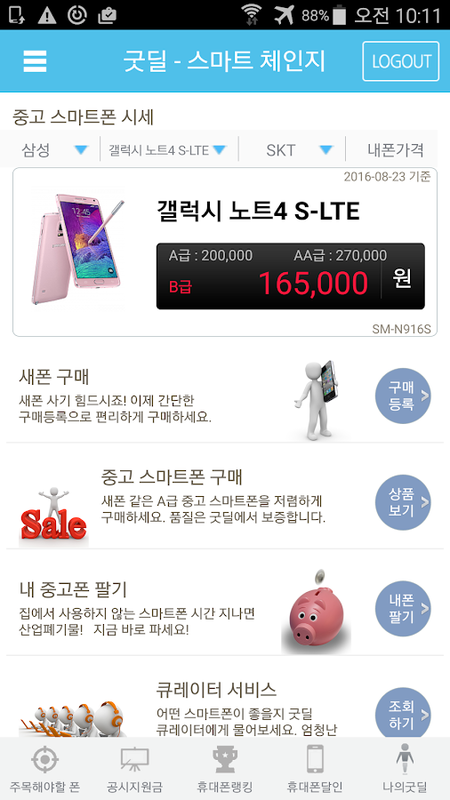 ■ 앱에서 다루는 기기 목록 갤럭시S2 HDLTE, 갤럭시노트, 갤럭시노트2, 갤럭시R, 갤럭시S3, 갤럭시그랜드, 옵티머스태그, 옵티머스LTE2, 옵티머스G,옵티머스뷰2, 옵티머스G프로, 테이크LTE, 베가넘버6,베가R3, 베가레이서2, 베가LTEM, 테이크HD, 테이크타키,테이크야누스, 프라다 3.0, 갤럭시S2, 갤럭시넥서스, 루미아710, 웨이브3, 넥서스S, 아트릭스, 모토로라레이저,옵티머스블랙, 베가레이서, 베가넘버5, 센세이션XL, 이보4G, 인크레더블, 디자이어HD, 옵티머스뷰, 갤럭시S7,엣지, 갤럭시S6 엣지, 아이폰5, 아이폰SE, 아이폰6s, 아이폰7, 아이폰8, g5, v20, v30, LG G6,갤럭시노트5, 갤럭시노트4, 갤럭시노트3, 아이폰6s플러스, 갤럭시노트엣지, 갤럭시S8, 갤노트7, 갤럭시노트7 리퍼폰,갤럭시노트8, 갤럭시S9, 아이폰8, 아이폰X, LG V30 등 [접근 권한 안내] ※ 알고사의 원활한 이용을 위해 아래접근권한을 허용할 수 있습니다. (선택적 접근권한은 허용하지 않더라도 서비스 기본 기능은 이용할 수 있습니다.) 1.필수적 접근권한 - 저장공간: 알고사에서 기기에 사진, 동영상, 파일을 전송하거나 저장하기 위해 사용. 2. 선택적접근권한 - 카메라: 게시판에 이미지 업로드 시 사진/동영상 촬영 기능을 제공하기 위해 사용. 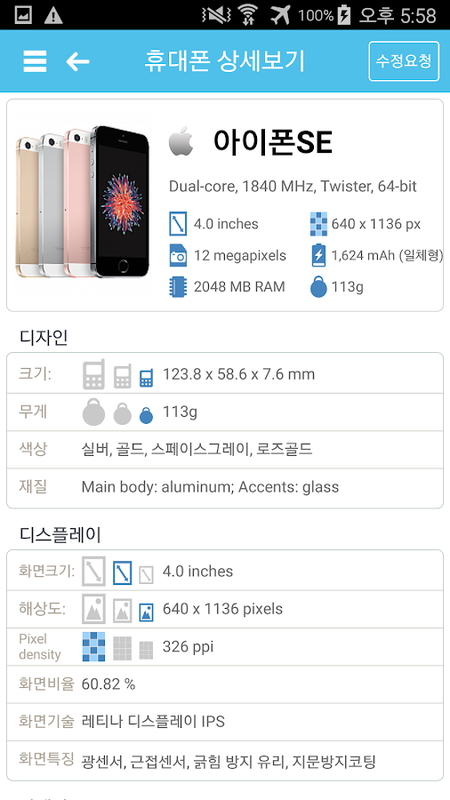 inSpec Smartphone ranking and spec Compare Can see thespecification information and the order of the latest smart devicesthat came out recently, you can compare the two products. You canalso quickly search by using the search function. Through a webbrowser, you can find more information. 누구나 쉽게 사고 파는 No.1 골프클럽/용품/중고골프채 전문 오픈마켓 프라이스골프입니다. 매매보호 서비스(에스크로)로쉽고 안전하게 거래할 수 있습니다. 간단히 회원가입만 하면 누구나 쉽게 보유하신 골프용품을 판매할 수 있습니다. 매일1,000여개의 중고, 신상 골프채, 골프용품이 실시간으로 등록되며, 매일 약 500여건의 신규 안전거래가 진행됩니다.각 판매자, 구매자들과 실시간으로 채팅쪽지, 상품문의가 가능합니다. 국내 유일의 중고시세표를 제공합니다. 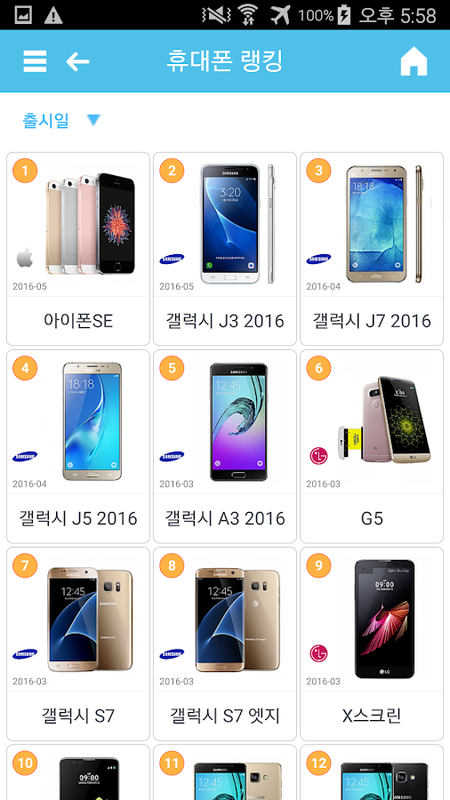 약 10여년 간축적된 데이터로 최근 중고상품의 시세를 쉽게 확인할 수 있습니다. 내 상품을 얼마에 판매해야할지 궁금하시면 중고시세표를참고해주세요. 프라이스골프에 등록되는 상품은 국내 대형 오픈마켓(인터파크, 옥션), 네이버 쇼핑, JTBC 골프 등타사이트에서도 등록, 검색됩니다. 최대한 빠르고 안전하게 상품을 판매하고 싶다면 프라이스골프에 상품을 등록하세요.프라이스골프 사용의 편의를 위해 다양한 기능을 운영하고 있습니다. [판/구매자가이드], [자주묻는질문]에서 필요한 정보를제공합니다. 궁금하시거나 요청사항이 있으시면 [고객문의게시판]에 글을 남겨주세요. 프라이스골프에서 쉽고 안전한 결제,새롭고 다양한 기능을 경험해보세요. Anyone buying and selling easier No.1 golf club/ Accessories / Used golf clubs specializing in open-market price.You can easily and safely deal with trade protection services(escrow). Simply just registering, anyone can easily sell golfequipment you have. Used, personal golf clubs, golf equipment forevery 1,000 is registered in real time, Every day is a new securetransaction proceeds of about 500 conditions. You can chat message,ask each product sellers, buyers and real time. It offers thenation's only owned inventory. 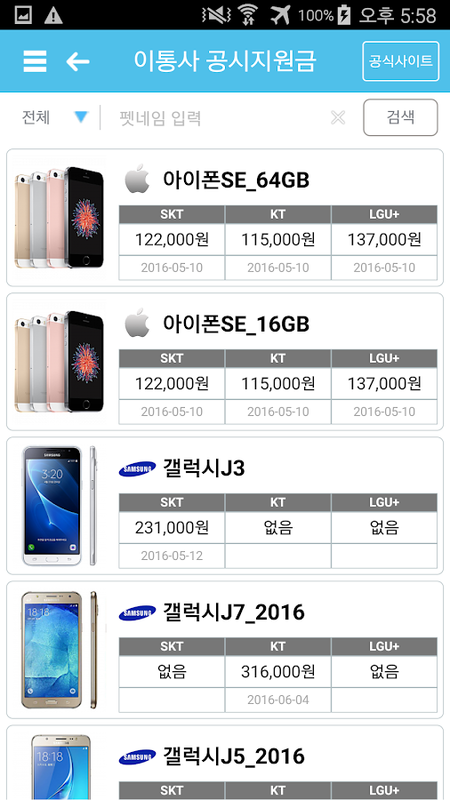 With the accumulated data forapproximately 10 years, you can easily see the recent price of usedgoods. I wonder if you know how much to sell my product, pleaserefer to the used inventory. 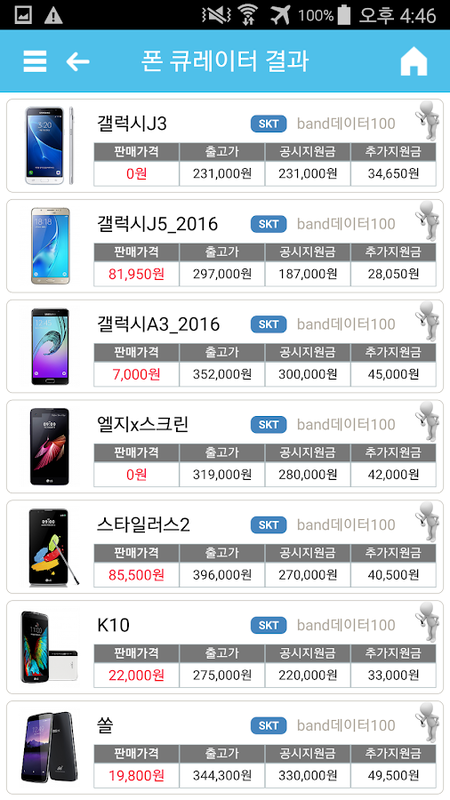 Products that are registered in theprice of domestic large Golf Open Market (Interpark, Auction),Naver shopping, JTBC golf and other sites in the register will besearched. If you want to sell items quickly and safely as possible,please register your product on the price of golf. And it operatesa variety of features for ease of use price Golf. [Edition /Buyer's Guide] to provide the necessary information in the[Frequently Asked Questions]. Guests can request If you have anyquestions, please leave a message on the Customer Contact Forum.Easy and safe payment Price Golf Experience a variety of newfeatures. letgo is the perfect online marketplace to buy and sell locally! Noneed to visit the flea market to find the best deals on preowneditems! Here you’ll find a wide selection of like new products, fromvintage clothes, antique furniture, used books and retro games, toelectronics, preowned cars and studios for rent! letgo is thebiggest and fastest growing app to buy and sell locally. Over 75million downloads and 200 million listings! Here's why tens ofmillions of people are buying and selling on letgo: MILLIONS OFLISTINGS •Shop for the best deals on anything you need in an onlinegarage sale. From vintage dresses, shoes and watches, to vintagebooks, used toys, a new iPhone or Samsung Galaxy, a secondhand carand even real estate for sale or rent! •Find and offer barter dealsor services in affordable prices. FAST AND CUTTING-EDGE •Listsomething in seconds, as effortlessly as taking a photo. letgo'sthe only app with advanced technology that automatically titles andcategorizes your listing, whether you’re selling a new iPhone oryour used car! •Make money selling your like new items. It’s safeand easy. FUN, SIMPLE AND INTUITIVE •Discover stuff for sale nearbyor search for something specific. •Check out other users’ profiles,ratings and reviews, and chat instantly in the app. **NEW** Buyinga new car or selling your used car? We’ve made it even easier tobuy and sell used cars, SUVs, trucks, motorcycles and othervehicles. Find your dream car on letgo - at a fraction of theprice! **NEW** Looking to invest in real estate or to sell your ownproperty? No need for a realtor - you can find and list propertiesfor sale or for rent: apartments, houses, studios for rent andother real estate on letgo! Your dream house is already on letgo!Download letgo and start selling your stuff, shopping for the bestbrands and finding discount deals on anything from fashion,electronics and used cars! It’s time to letgo! Team letgo --- ------ --- --- --- --- --- --- --- --- --- Want to give us feedbackabout "let go"? Need help? Feel free to contact us [email protected] --- --- --- --- --- --- --- --- --- --- --- --- Thisapp uses the original sound "Level Up 01" of the user "rhodesmas"onfreesound.org(https://freesound.org/people/rhodesmas/sounds/320655/)with aCreative Commons license under the Attribution 3.0 Unported terms(http://creativecommons.org/licenses/by/3.0/). One of the most downloaded boot sale, flea market and classifiedsapps with over 10 million users. Google recently added Shpock as anAndroid Excellence App of 2018 "Love a car boot sale but don'tfancy getting out of bed? Then you need Shpock." (The Sun) Buy andsell easily with Shpock. Find great deals and turn items into cash.Save time and earn money. Whether looking for second hand, used,vintage, new or simply beautiful classifieds, Shpock is alwaysthere as the SHop in your POCKet. Enjoy 24/7 access to yourmarketplace. WHY USE SHPOCK? ★ Among the Top 5 most downloaded UKShopping Apps in 2016 and 2017. 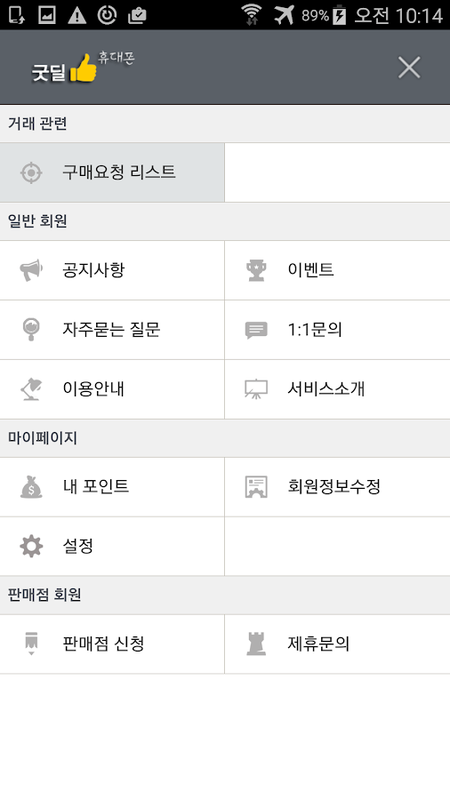 ★ More than 10 million users andmany more items. ★ Easy-to-use. ★ Buy and sell anywhere anytime,locally or far away. ★ Find great bargains from millions ofclassifieds. NEW FEATURE Easier, faster, more secure: use PayPalfor purchases and sales. Pay directly in the app and receive yourmoney immediately. Both sides benefit from PayPal’s BuyerProtection or PayPal’s Seller Protection. WITH SHPOCK YOU CAN: ★List adverts for sale in seconds: add photo, a few words, price…and that’s it! ★ No listing and transaction fees. ★ Share your adson Facebook or Twitter and sell faster. ★ Create search alerts andcatch the newest offers on your favorite items. ★ Communicate: askquestions openly – chat and bargain privately. 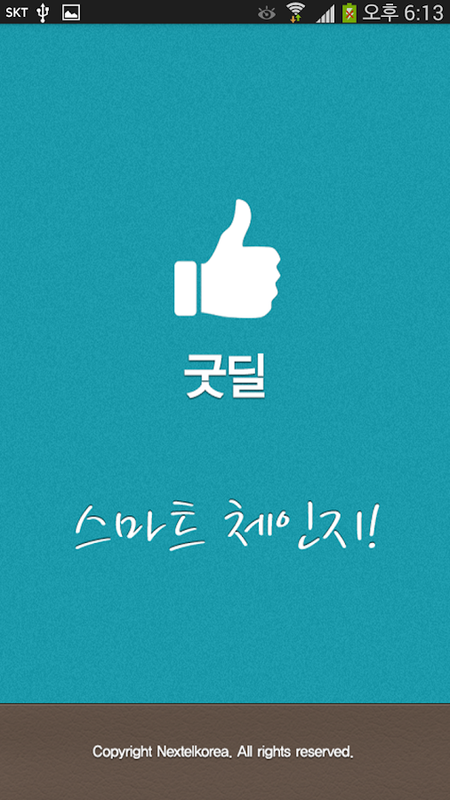 ★ Create acommunity: invite and follow your friends and other Shpock users.Give and get Likes on local offers. Help each other sell faster. ★Meet nice people nearby. ★ Start your own designer shop or discovertalented young designers. ★ Build trust: only trustworthy users buyand sell on Shpock. If somebody breaks the rules – let us know byreporting the questionable item or user ABOUT SHPOCK Shpock fleamarket, boot sale & classifieds app for beautiful things. Itmakes buying and selling extremely simple and fun. Thousands ofitems are listed daily for every taste: new and used clothes,second hand shoes, games, electronics, game consoles, smartphones,TV, young designers apparel, fashion, vintage, second handfurniture, sofas, beds, tables, baby goods, prams, preloved cars,bikes, home and garden, yard stuff, books, tickets, rentals, rooms,flats, apartments, other property, unwanted gifts and much more…Best wishes in your success journey! Install it now and get thefree mobile market place! TALK TO US! We want to do everything tomake your Shpock using experience as easy as possible. If you needany help please contact our customer service on [email protected] email or @shpock via twitter. You can also find us on: ★Facebook: https://www.facebook.com/ShpockUK/?fref=ts ★ Instagram:https://www.instagram.com/shpockapp/ ★ Twitter:https://twitter.com/ShpockUK ★ Snapchat:https://www.snapchat.com/add/shpockapp Download NOW – get a SHop inyour POCKet!